All the more easy to humiliate Ferraris on the track with. Ever been hungry to the point that white girl persona comes out saying things like “I’m starving” or, “I could literally eat a whale.” And that’s what happens. Fifteen minutes and a steak dinner later and a coma-like state is induced. Put simply, the body needs that time to digest everything. 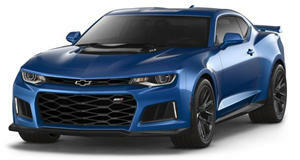 Well that’s not so dissimilar to what happened when Chevy announced the 1LE package for the already absurd ZL1. With so much going on under the sheet metal, time to absorb it all was a must. Kelly Blue Book is up to the task and its resident test driver, Micah Muzio does a good job at driving it. Not like there’s much of a choice. With 650 horsepower under the hood, Chevy’s impeccable Alpha platform tying it all together, and the ZL1 package unlocking a higher degree of ability on the track, digesting this car is the job of a pro. And Muzio is kind of a pro. The results are as incredible as the ZL1 1LE’s Nurburgring times lead on, with high speed cornering being less of a nerve wracking experience thanks to the stability offered by the aerodynamic upgrades. It’s a good thing that this first look dive is done on the race track because it requires quite a bit of speed for the 1LE upgrades to become apparent. It’s at this point that the genius of the 1LE is plain to see, because even with an features list that sounds intimidating to track day virgins, the Camaro is easy to drive. Get a napkin for that drool will ya?